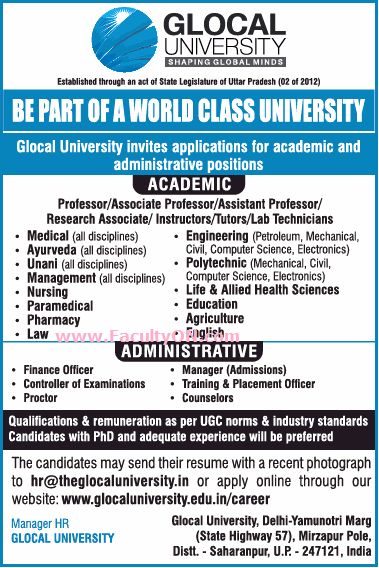 Glocal University, Sharanpur has advertised in THE TIME OF INDIA newspaper for the recruitment of Professor / Associate Professor / Assistant Professor / Research Associate Plus Non-Faculty jobs vacancies. Interested and eligible job aspirants are requested to apply immediately from 25th July 2018. Check out further more details below. About University: At the Glocal University, we strongly believe in harnessing the power of knowledge by combining learning with extensive application-based study and professional ethics, thus maximizing one’s overall potential and nurturing a winning mentality in each of our students. How to Apply: Interested and eligible candidates are requested to send application along with CV, copies of certificates / mark sheets and recent PP size photos to the following email address or apply online at the official website.